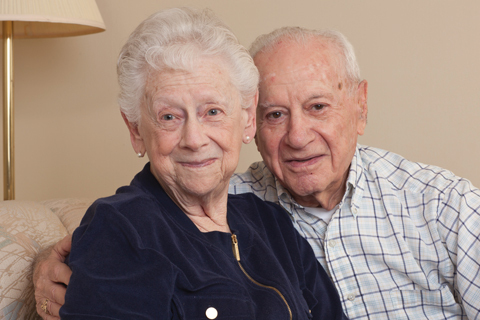 At age 87 and 88, Claire and Irv T. are blessed with a full life and a large and healthy family. Irv needs no coaxing to brag about his three children, nine grandchildren, and four great-grandchildren. Artwork proclaiming him as the “World’s Greatest Pop Pop” is prominently displayed among dozens of photos depicting a lifetime of memories. He shares brief stories about each, but comes to a halt at the portrait of a World War II era young bride and groom. Claire chuckles at her husband’s remark, a joke she’s heard dozens of times. However, for the past few months, she and Irv had little to laugh about. A serious fall in her kitchen left Claire with a broken knee. She spent several weeks in a rehabilitation facility unable to put any weight on her leg. The ordeal took a toll on both Claire and her husband. “Irv was always by my side, but it was hard for him to come to the facility all the time” shares Claire, who couldn’t wait to go home. Once back in her comfortable apartment, Claire wanted to be out and about, getting around as easily as she had before the fall. However, her injury prevented her from even getting out of her wheelchair. Without physical therapy, leaving home would be impossible. The sessions were challenging for Claire, but with Jenn’s guidance and support, she kept up the therapy and gradually, began to improve. Today, Claire is able to walk around her apartment using a walker, without assistance from anyone. What’s more, she and Irv have been able to resume some of their favorite activities, like going out to lunch and visiting their family. Jenn, who earned a Master’s degree in physical therapy, joined BAYADA four years ago after working in a hospital-based acute rehabilitation facility. Jenn is thrilled that Claire made such great progress that she no longer needs home-based physical therapy. For additional resources on falls prevention visit BAYADA Home Health. 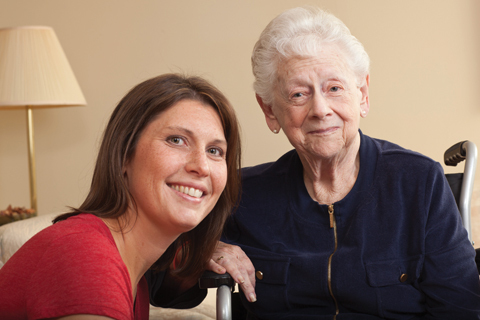 To learn more about home health care services, click here or call 888-4-BAYADA. Let's connect. You can call us, or we'll call you. © BAYADA Home Health Care, . All Rights Reserved. BAYADA is accredited by Community Health Accreditation Partner for meeting the industry’s highest nationally recognized standards of care.